Today I thought I’d show you a completely different way I styled my black cardigan with the leopard print collar. I like to think of this as a relatively classy and sophisticated outfit; hopefully with a vintage element, in contrast with the more casual and fun look when I last styled this cardigan. This is the first time I’ve worn this skirt. At first I wasn’t sure about it but now I love it. I bought this skirt about a year and a half ago because it was an incredible bargain and I was drawn to the polka dots. I always intended to hem this skirt to slightly above my knees and I never got around to it. I was a little unsure of wearing it at this length because it was outside my comfort zone. It’s also very different from the cut of skirt I usually wear; I generally find skater skirts more flattering. I’m sure it’s pretty obvious that I have a very specific style and I don’t deviate from it particularly often. As time went on, I never got around to making the intended changes to my skirt and it sat around in my wardrobe. Recently, I decided to give this skirt another chance and my opinion of it changed completely. I realised that making it shorter would actually detract from the style and cut of the skirt. I adore it just the way it is. It was almost as exciting as buying new clothes. I’m not sure what else I can wear with this skirt but there must be many possibilities; I’m sure many of my cardigans would pair rather nicely with it. My sisters in law helped me take these pictures a number of weeks ago; I was told I look like I’m going to Paris and I should wear this if I ever go there. To Sara of The Polished Edge, I say I definitely will! A few people have asked about my job so I thought I’d use this opportunity to write in more detail about it. I work in a multinational corporation in Sydney city as a Company Secretarial Officer within Investment Management. Company secretarial is actually a legal job, quite contrary to the name. The main responsibilities are to ensure that the company complies with regulatory and legal obligations and board of director decisions are applied. This involves organising and attending meetings of directors, preparing agendas and minutes, ensuring that the company maintains necessary documentation and registers required by corporations law, being aware of meeting procedures under the company constitution and corporations legislation, liaising with directors, ensuring all returns to the Australian Securities and Investment Commission are made in a timely manner, supervising financial administration, and probably many other responsibilities which I’m yet to find out. As a Company Secretarial Officer, I assist the company secretary and I’m learning so much. It’s a incredible experience. Full time work has been positively life changing. I’m so grateful for the opportunity to start my very first job in such an established reputable company.I’ve also found an area of interest; I always worried what I’d do with my law degree given that I’ve never had any interest in actually being a lawyer. This way I’m using my degrees but I don’t have to follow the traditional legal path which isn’t right for me at all. The greatest benefit from full time work is the impact it’s had on my confidence and how I feel in myself on a daily basis. As a long term sufferer of major anxiety and with self confidence issues, I never thought I’d be capable of anything like this. The amount of doubt and worry I went through before starting work was intense but for the first time in as long as I can remember I don’t feel like a loser; I believe I’m capable of more than I’ve ever given myself credit for. I finally feel good enough and worthy of happiness. This sense of achievement feels incredible and provides motivation to try my best everyday. I love my workplace, I’ve met wonderful people; one in particular that has changed my life and values me for who I am. This is so much more than a job for me; it’s the start of the rest of my life. Work has filled a void of unhappiness; for the first time in so many years I feel happy and satisfied with where I’m at in life. It’s been a long time coming and every day I cannot believe it’s real. I’ve been through a lot to get where I am today; it’s been a very personal journey. At my lowest points I couldn’t see a future for myself but now I can’t wait to build a better life. Looking back I believe everything happens for a reason. It was all worth it to reach where I’m at now. I never thought I’d say that. I hope it continues to remain so positive. I’m still surprised that full time work is actually the best thing that’s ever happened to me; I’m always so fearful of trying new experiences and stepping outside my comfort zone but it was exactly what I needed. It’s inspired me to think more positively and value opportunities; I hope this will translate into other areas of life. I view long hours at work or stressful situations as a chance to progress my skills. Each morning I try and think about how much I value my current life situation. Take a chance and it may well pay off! One of my greatest wishes in life is to use my experiences to help others. When I became depressed, extreme negativity occupied every moment of my every day and drained the life from me; it was incredibly exhausting. But there was the tiniest hope in me that one day, if I ever did get better and feel happy again, something positive could become of my journey. I have no idea how to put this into practice but it’s a long term goal that I’ll eventually work out. I’d love to help others to feel better and find the joy in life again. This rather ambitious goal motivates me frequently. There is hope for everyone; I’ve been right to the bottom. Of course, I’m still learning; worthwhile ventures take time. I’ll always have to watch my anxiety but taking advantage of opportunities, believing in myself and keeping busy are the best ways for me to move forward and enjoy life. I’m very nervous about posting this, I’ll probably experience extreme panic as I hit publish, so please be nice! I have extreme admiration for bloggers who open up to us, share their personal lives, have a genuine desire to help others and raise the broader issues in life beyond fashion. I hope to write more about this in the future; writing is very helpful and satisfying. This entry was posted in Bardot, Forever New, Outfits, Sportsgirl, Valleygirl. Bookmark the permalink. This is such a classy and gorgeous look! You look always elegant my dear, I love your pencil skirt!!!!! You sure know how to wear a pencil skirt, so classy! Gorgeous outfit… all the way around! The bow in the back of your hair… the perfect exclamation point to your stylish ensemble! I'm glad you didn't shorten the skirt! I love it this length, very classy. I'm so happy you are enjoying your work and feeling so much more positive =) Good luck to you! lovely look & great polka dots skirt! I adore this polka dot skirt! Love this outfit. Such a striking and chic look. All of your outfits are absolutely charming! I'm so glad things are looking up for you and that your new job is going well! Taking a new step in life is hard, but I'm really glad it's paid off. Plus you look incredibly cute here. 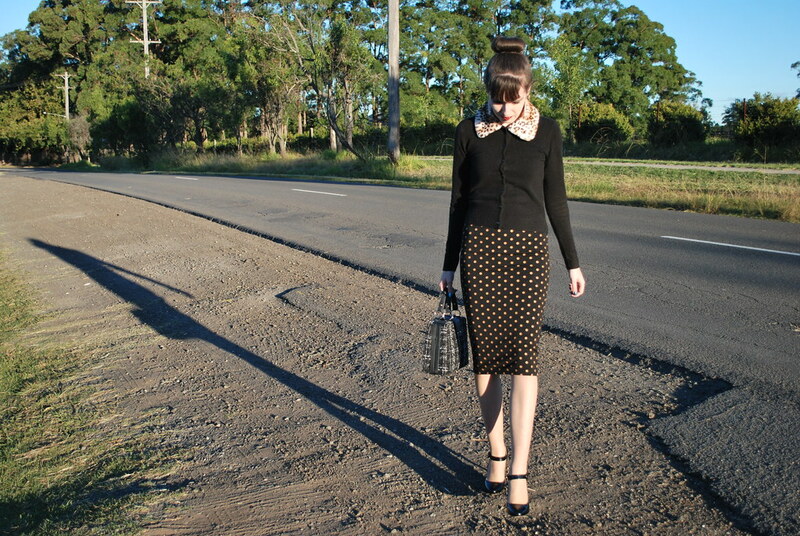 That polka dot pencil skirt looks amazing on you and I love the leopard print collar on your cardigan too. So elegant, love this look.